Do you love gooey, chocolate fudge brownies? Then you will love this recipe. 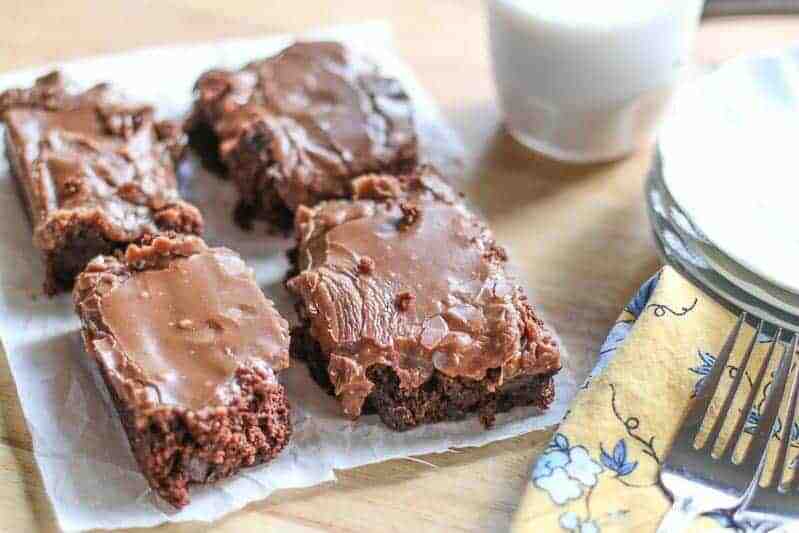 This sweet recipe adds buttermilk to to the batter for moist brownies and a homemade crackly fudge gooey frosting. After one bite, you will not be able to walk away. These are wicked good! This post is dedicated to my furry friend Ginger. We will miss you. My dear friend Kim Pryzgoda, unexpectedly lost her dog, Ginger. 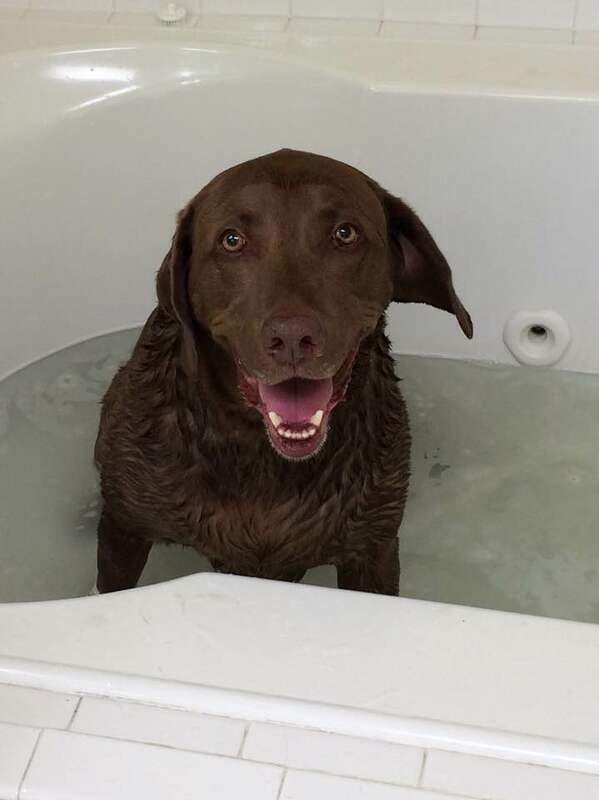 Ginger was a beloved chocolate lab family member to the Pryzgoda household. She was always ready to greet you at the door with a big wagging tail and a friendly doggy hello. Ginger was full of bounce, energy, and love. She never tired of scratches on her ears, fetch in the back yard, or snuggles with the kids when she was tuckered out. She favored a special blanky that she loved carrying around. You would see this big dog running around with a little blanky. It was quite comical. When she was not snuggling with it, she would try to entice anyone that was willing with a quick game of tug-and-war. When I visited to the Pryzgoda home, I knew I was going to receive a big doggy hug and a wet, smoochy kiss upon entering. When I heard the news that Ginger passed away, my heart broke for the Pryzgoda family. Their home became a little more quiet, a little less lively, a little more empty, and a little more lost. A dog’s love is truly unconditional and it is a heavy loss when it goes away. When I heard the devastating news, I wanted to do something a little special to acknowledge that I was thinking of them in their sad time. I show my love with food, therefore, I created these chocolate fudge brownies. I was hoping a little sweetness would honor her memory and bring a small amount of comfort. 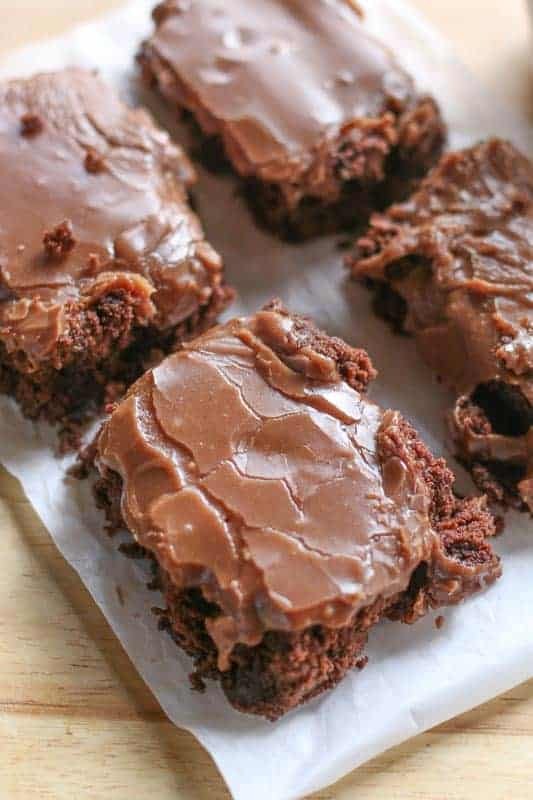 I make these brownies with the Ghirardelli Double Chocolate Brownie mix, but I add different ingredients. Honestly, Ghirardelli makes the BEST chocolate brownies and it is hard to beat them. 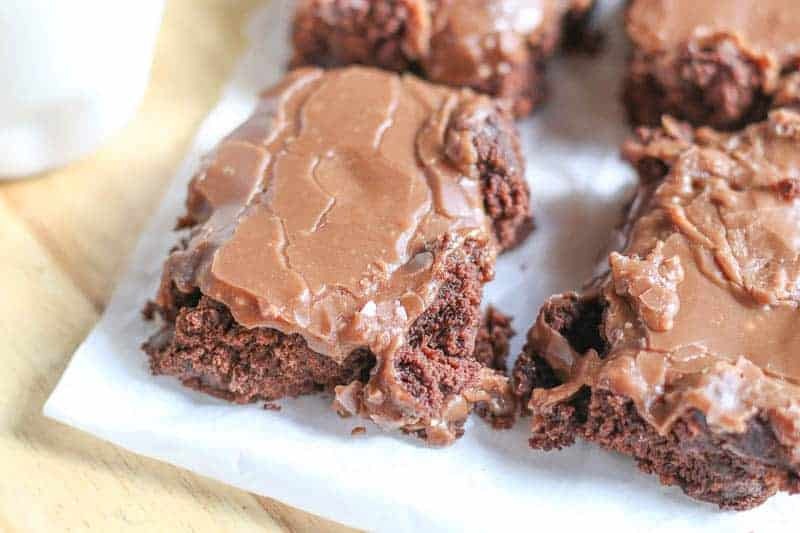 Their double chocolate brownies have a fudgy chocolate batter with chocolate chips that add a little crunch when cooled down. I add butter and buttermilk to make them off the chain…. 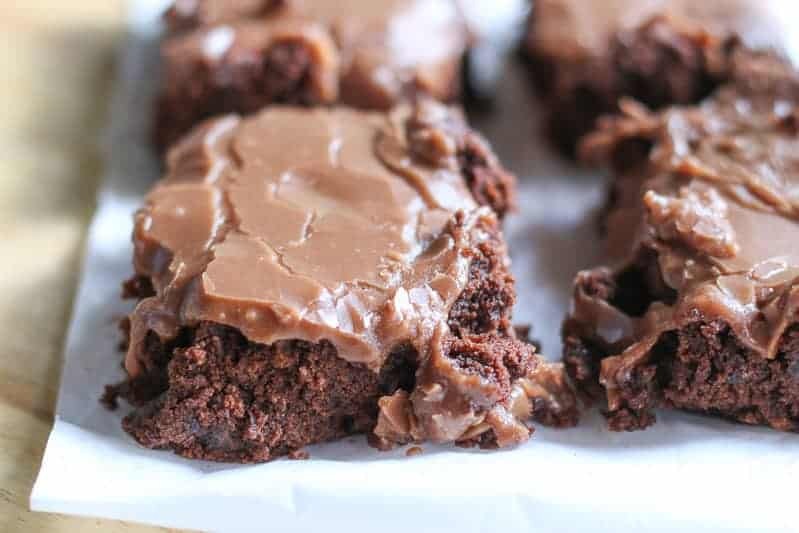 You can use a different brownie mix, but if they don’t turn out as good, I don’t want to hear about it…. just saying! The brownies are amazing all by themselves, but I take them to a whole new level with my fudge gooey frosting. This is the stuff willy Wonka would have floating down that chocolate river. Friends, this stuff is ridiculous. Enjoy! For more sweet treats, check out: Coconut Cream Poke Cake, The Best Lemon Bar Recipe, and Chocolate Cherry Sheet Cake. Mix brownie mix, 12 tbs butter, eggs, buttermilk, and 1 tbs vanilla in a large mixing bowl. When completely combined, pour into prepared baking dish. Bake for 45 minutes or until center is set, but still a little soft. Cool for 20 minutes. In the last 5 minutes, begin making frosting. In a medium sauce pan, melt butter over medium heat. Stir in cocoa and milk. Continue to stir until it begins to reach a soft boil. Remove from heat and quickly mix in powder sugar. Pour frosting over brownies. Allow brownies to completely cool before serving and cutting. So sad about Ginger! It’s the hardest losing a furry family member, but you are the best friend ever for making these brownies. If chocolate can’t comfort someone, nothing can! I love the Ghirardelli Double Chocolate Brownie Mix and will try your way next time I make them. Ginger looks so sweet and gentle. So sad when a furry friend is lost. I’m sure she is up in doggy heaven with allll the yummy treats.